This seems obvious, but their right to a long-overdue quality school facility is being challenged and hangs on a crucial vote Tuesday by the LA Unified school board. Students and parents are the most important voice in this debate over the school’s future, and we hope the board listens to their input when making the final decision tomorrow. We urge LAUSD to move forward with modernization plans for the campus without further delay. Recently, the school’s Comprehensive Modernization Plan, which has been under review for several years, encountered unexpected opposition from some school alumni and specifically from the LA Conservancy, expressing concerns about the school’s rich history. Let’s be clear, it is about one building in the school’s complex. They oppose the demolition of the R Building, where the auditorium and numerous classrooms are housed. It was from this building that Roosevelt students walked out in 1968 – along with students from Garfield, Wilson, and Lincoln high schools. The groups opposing demolition want to significantly change the renovation plans in order to have the R Building considered a historic landmark that should be preserved. There is absolutely no question that 1968 was a critical moment in the history of the Mexican-American community. Those students sparked a movement that forced the closure of the LA Unified School District and led to the creation of Chicano Studies as well as bilingual education. They demonstrated their power to have a role in the transformation of education policy. The “Blowouts” of 1968 launched a legacy of struggle for education justice that inspired the Chicano/Chicana student movement across the Southwest. Today’s students also want to learn and continue with the proud tradition, although their educational opportunities are limited by damaged and old buildings which do not have the infrastructure that current education demands in order to prepare them for their future. Roosevelt High’s structure limits the school in fulfilling the mission inspired by students 50 years ago to provide an excellent education for all. 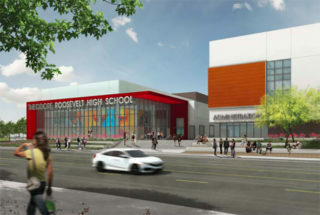 The Comprehensive Modernization Project of Roosevelt High is meant to address this problem by allocating $173 million from a bond approved by voters. The plan is to build six new buildings that provide safeguards that buildings from the 1920’s simply cannot offer and to provide state-of-the-art facilities for 21st-century learning. In today’s world, education is inseparable from technology. Terms like “connectivity gap” and the “digital divide” capture the deep divisions between schools, a gap that disadvantages higher-need students. The bandwidth and capacity needed in technology infrastructure are key factors in the ability of students to access data, advance academically, and prepare for the jobs of today and the future. The only way to create this necessary infrastructure at Roosevelt High is to build new buildings specially designed to enable this model of technology. The plan also includes constructing a large wellness center offering medical, dental, and mental health services as well as providing space for community meetings. This ensures that the students and their families will have medical attention when they need it. At the same time, the center will become a vital point of integration between the community and the school. In order to do this, the plan calls for demolishing 11 old buildings and 17 temporary facilities. The R Building is included as part of this demolition. Simply upgrading the building would be extremely impractical, and it would reduce the number of classrooms that could be created. The project does take into consideration the historic significance of the school. There are a set of specific proposals to honor the legacy such as incorporating some of the characteristics that reflect the historic period and its cultural identity. It is completely understandable that there are individuals who want to save the building’s exterior and the stairwell because of what occurred in this structure. But Roosevelt High is more than a memory. It is a school with students who deserve to have the opportunity to learn and grow with the best tools that education can provide. We want more Roosevelt students to be part of the statistics reflecting academic success. The students think so as well. That is why a strong majority of the school’s students, teachers, and administrators, those who use the facilities day in and day out, support the complete renovation of the school. Over 700 students and parents signed a petition in favor of wanting Roosevelt High to have the tools necessary for its students to succeed academically and professionally without delay. The students who walked out 50 years ago demanded a better education, facilities that could support their learning, and greater integration with the community. The fully renovated Roosevelt High could achieve the demands of the youth of 1968 and support the students of today. To support the present with a look to the future is the best way to honor the past. Maria Brenes is executive director of InnerCity Struggle, a nonprofit advocacy organization that since 1994 has worked with youth and residents of Los Angeles’s Eastside to promote safe, healthy, and non-violent communities.